The ship "Fri" at clock side Niagara on the Lake Ontario. 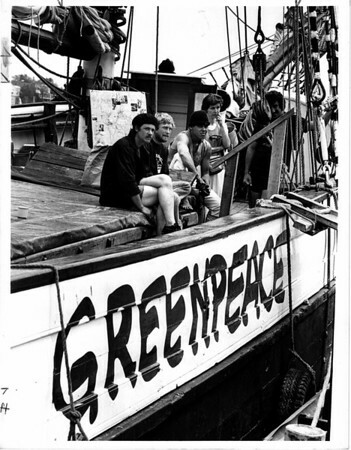 Crew members from left to right - Gary Crosslin, USA (crew), Mark Jackson, USA (crew), Claus Bager Denmark (crew), and Joyce McLean with the Greenpeace movement in Toronto, Ontario. Photo - By Ron Schifferle - 6/7/1985.